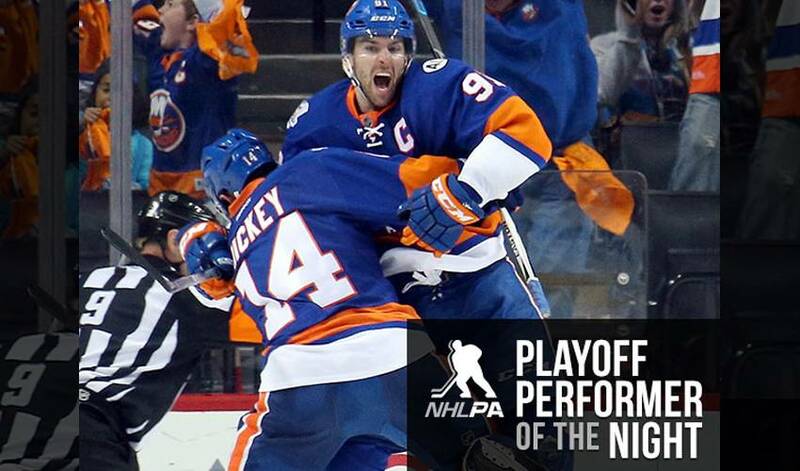 Earning PPOTN honours was twice as nice for John Tavares, who notched a pair of goals, including the double OT winner, as the New York Islanders beat Florida 2-1 to move on to round two of the Eastern Conference playoffs. The Isles captain tied the game with under a minute to go and then delivered the series-winning tally in front of a delirious Barclays Center crowd. STAT PACK: Tavares took six shots, blocked two, took 40 shifts, went 18-13 (58.1 per cent) in the faceoff circle and played 34:49. THE EXTRA MILE: Tavares – the franchise’s all-time leader in regular-season overtime goals with eight – scored his second career overtime goal in the postseason (also Game 3 of 2015 first round vs. Washington). LUCKY No. 7: Tavares became the seventh player in franchise history to score a series-clinching goal in overtime and the second to do so in multiple overtime periods, joining Pat LaFontaine’s famous winner in Game 7 of the 1987 Patrick Division Semifinals at Washington (3-2, 4OT). INTO THE RECORD BOOKS: Tavares became the first player in franchise history to score a game-tying goal in the final minute of regulation and then notch the overtime-winner in a playoff game. The only other instance in franchise history the Islanders accomplished the same feat was in Game 3 of the 1993 Patrick Division Semifinals vs. Washington, when Pierre Turgeon tied the game at 19:17 of the third period and Ray Ferraro scored at 4:46 of overtime (4-3). HOLDING THE HOT HAND: Tavares – who shares the NHL lead with five postseason goals and led all Islanders with 5-4—9 in the First Round – has registered 11-9—20 in his last 12 outings dating to March 31 (regular-season and playoffs). TRAILBLAZER: He became the first overall pick in the 2005 OHL Draft after the league adjusted the age entry requirement to allow him to be drafted. Tavares made his OHL debut as a 15-year-old, after receiving ‘exceptional player’ status and was tabbed as the CHL Rookie of the Year in 2006. ANOTHER ARENA: Tavares played lacrosse growing up, as his uncle, also named John Tavares, is the all-time scoring leader of the National Lacrosse League. He was once a ball boy for his uncle’s National Lacrosse League Buffalo Bandits. HONOURABLE MENTIONS: On Friday, Michal Neuvirth stopped all 44 shots he faced as Philadelphia beat Washington 2-0. Alan Quine scored the double OT winner and Thomas Greiss saved 47 of 48 shots in a 2-1 New York Islanders win over Florida. Mikko Koivu tied the game and then won it in OT as Minnesota bested Dallas 5-4. Joonas Donskoi had two goals and Brent Burns had three assists, leading San Jose to a 6-3 victory over Los Angeles and onto the second round. On Saturday, Bryan Rust had two goals and three points in Pittsburgh’s series-clinching 6-3 win over the New York Rangers. David Perron recorded a goal and an assist, along with a plus-2 rating, in Anaheim’s 5-2 win over Nashville. Andrew Ladd and Marian Hossa each netted a goal and an assist in Chicago’s 6-3 triumph over St. Louis. On Sunday, Nicklas Backstrom scored the only goal and Braden Holtby stopped all 26 shots as Washington beat Philadelphia to move on to the next round. Jason Spezza had four points (one goal and three assists) as Dallas beat Minnesota 5-4 to win the series. Jared Spurgeon had two goals for the Wild.